NBA.com/Stats | How Do The Rockets Keep Getting Open 3-Pointers? Stats Home / Articles / How Do The Rockets Keep Getting Open 3-Pointers? How Do The Rockets Keep Getting Open 3-Pointers? The Rockets have become famous, or infamous, depending on your point of view, for their shot selection over the past few seasons. Last year, they set a new NBA record by attempting 40.3 3-pointers per game. 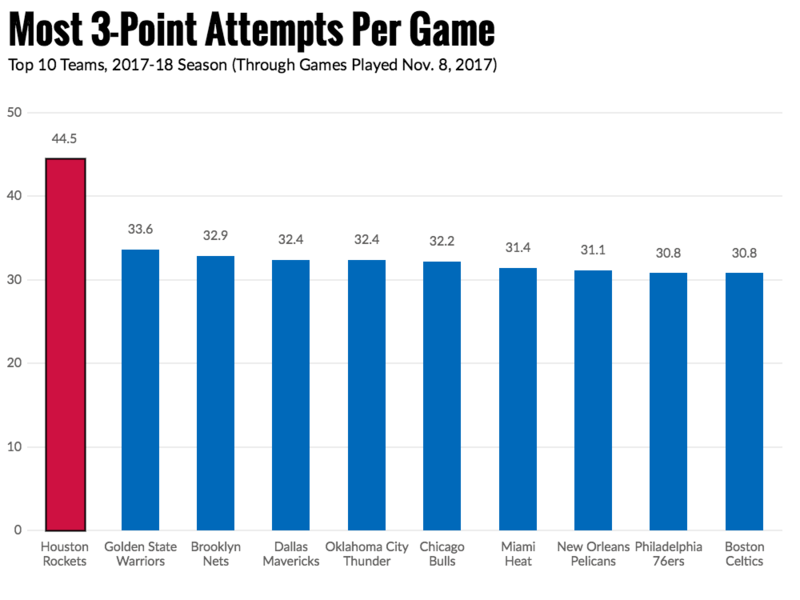 This season, they’re on pace to break their own record by about 10 percent -- increasing their mark to 44.5 3-pointers per game. The second-highest mark in the league is the Golden State Warriors at just 33.6. Every defense they face knows that the Rockets are focused on exploiting the high-value areas around the basket and behind the 3-point line. Even with that knowledge of Houston’s fairly rigid offensive intentions, no one really seems able to stop them. Despite their record setting 3-point attempt rate, 85.6 percent of Houston’s 3s have been either open or wide open to begin this season. If everyone knows the Rockets want to shoot 3s, how in the heck are they getting so many open ones? As several analysts pointed out last season, one way they accomplish it is by simply staying farther behind the 3-point line and farther from defenders. So far this season, Houston has attempted 334 shots that were at least 25 feet from the basket (that’s at least a foot behind the 3-point line). That’s 70 more than any other team in the league. Last season they had nearly 400 more attempts (just under five per game) from this distance than any other team in the league. Defenders aren’t used to covering shooters two and three feet behind the 3-point line and a simple willingness to shoot from that distance is usually enough to make sure the shooter is open. Houston also shot 35.0 percent from that distance last year. The other mechanisms Houston uses for creating open shots is spacing and penetration. Eleven Rockets are averaging at least 5.0 3-point attempts per 100 possessions this season. Not all of those players are shooting a high percentage (although several are historically accurate shooters off to slow starts) but all are comfortable spotting up behind the arc. Because they have so many shooters on the roster, their five man units are almost always loaded -- of their 10 most-used lineups this season, seven feature at least four 3-point threats, the other three lineups have five 3-point threats. To take advantage of that space and shooting, the Rockets have James Harden and Clint Capela to run pick-and-rolls in the middle of the floor. In case you missed his 56-point, 13-assists performance last week (creating an astonishing 91 of Houston’s 137 points), Harden is quite the offensive engine. He is second in the league in drives per games, points scored on drives per game, and assists off of drives per game. It’s not just volume, he’s incredibly efficient as well -- ranking in the 61st percentile in points per possession as the ball-handler in a pick-and-roll and the 88th percentile in isolation. If a defense was somehow able to corral Harden’s penetration without leaving a shooter uncovered on the perimeter, it probably means Capela or Nene are open rolling into the paint. Capela is now in the 96th percentile in scoring efficiency as the roll man in the pick-and-roll, scoring 1.58 points per possession -- about the same expected value as sending a 79 percent free throw shooter to the line for two. Houston doesn’t create high value shots with misdirection, they do it with execution, by leaving the defense with impossible choices -- between an open 3-pointer and Harden or Capela running free in the lane. Given how things have gone so far this year, the open 3-pointer might actually be the best choice -- Houston has made just 34.5 percent of their open and wide open 3s to start the year. At some point, though, those percentages are likely going to progress towards the mean, Chris Paul is going to return, and an elite offense might get even better.